The presidential aspirant has all but disappeared from public, reportedly bored but not bitter. The man who planned to be president wakes up each morning now without a plan. Mitt Romney looks out the windows of his beach house here in La Jolla, Calif., a moneyed and pristine enclave of San Diego, at noisy construction workers fixing up his next-door neighbor’s home, sending regular updates on the renovation. He devours news from 2,600 miles away in Washington about the “fiscal cliff” negotiations, shaking his head and wondering what if. It’s not what Romney imagined he would be doing as the new year approaches. Four weeks after losing a presidential election he was convinced he would win, Romney’s rapid retreat into seclusion has been marked by repressed emotions, second guessing and, perhaps for the first time in the overachiever’s adult life, sustained boredom, according to interviews with more than a dozen of Romney’s closest friends and advisers. The defeated Republican nominee has practically disappeared from public view since his loss, exhibiting the same detachment that made it so difficult for him to connect with the body politic through six years of running for president. He has made no public comments since his concession speech in the early hours of Nov. 7, and avoided the press last week during a private lunch with President Obama at the White House. Through an aide, Romney declined an interview request for this story. After Romney told his wealthy donors that he blamed his loss on “gifts” Obama gave to minority groups, his functionaries were unrepentant and Republican luminaries effectively cast him out. Few of the policy ideas he promoted are even being discussed in Washington. One longtime counselor contrasted Romney with former Vice President Al Gore, whose weight gain and beard became a symbol of grievance over his 2000 loss. “You won’t see ‘heavyset, haggard Mitt,’” he said. Friends say a snapshot-gone-viral showing a disheveled Romney pumping gas is just how he looks without a suit on his frame or gel in his hair. 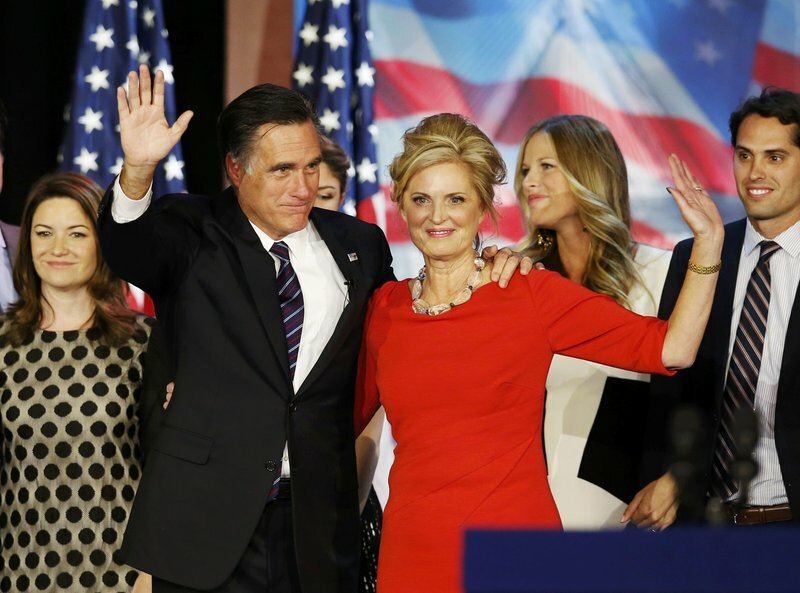 By all accounts, the past month has been most difficult on Romney’s wife, Ann, who friends said believed up until the end that ascending to the White House was their destiny. They said she has been crying in private and trying to get back to riding her horses. Romney has been keeping in shape with bike rides around La Jolla, past the bistros and boutiques that hug the rugged coastline. The son of Detroit — who boasted of the Cadillacs he owned as a sign of support for the U.S. auto industry during the campaign — was spotted driving a new black Audi Q7, a luxury SUV manufactured in Slovakia. Over Thanksgiving, one of Romney’s five sons, Josh, his wife and their four children packed into a single bedroom at the Spanish-style villa on Dunemere Drive here. One friend said they ordered their turkey dinner from Boston Market, the home-style restaurant chain, because there were too many kids running around the house to bother with cooking a feast. That big renovation to transform the Romney beach house into an 11,000-square-foot manse complete with a car elevator? It hasn’t begun yet. Romney also is plotting his next career steps — a return to business, perhaps, or something in the charitable realm or with the Mormon Church, said friends who have discussed possibilities with him. He kept a diary on the campaign trail and is considering writing a book. Romney has ruled out running for another office, adviser Eric Fehrnstrom said. Still, he doesn’t plan to recede completely from public life. “He’ll be involved in some fashion because that’s the commitment of his family to public service,” Fehrnstrom said. After Romney’s father, George, lost his 1968 presidential race and finished serving in President Nixon’s Cabinet, he ran a national nonprofit organization that advocated volunteerism. Friends said Romney has mentioned the Clinton Global Initiative as a model he might replicate. Unlike the last two unsuccessful nominees, Sens. John McCain, R-Ariz., and John Kerry, D-Mass., Romney had no job waiting for him. His public platform fell out from under him on election night. “That transition to happen so fast — it’s got to be hard. He doesn’t talk about it or really show it, but I know it’s got to be painful,” said L.E. Simmons, an oil investor and close friend who visited the Romneys here the Friday after Thanksgiving. In private, Romney has told friends he has little interest in helping the Republican Party rebuild and rebrand itself. Here in California, there is still some joy, friends say. A photo surfaced before Thanksgiving showing a grinning Romney riding a roller coaster during a visit with his grandkids to Disneyland. “He was pulling my leg,” Miller said.